Bourbon Banana Cream Pie is dreamy. It’s your classic banana cream pie spiked with bourbon. 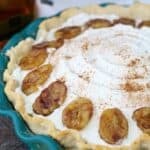 This pie has a traditional blind baked crust, with a bourbon vanilla cream filling, fresh bananas and homemade whipped cream. When I first started this blog, I was by no means a fan of the banana cream desserts. But as I have expanded my dessert palette over the past several years, I have my friend Lindsay to thank for this. She first introduced me to banana cream and I never looked back. I’ve always loved bananas, and it’s a staple in my daily diet. So, when I combine banana with a dessert, it’s pretty much game over for me. 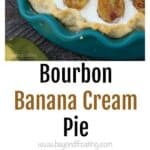 Let me introduce you the Bourbon Banana Cream Pie. 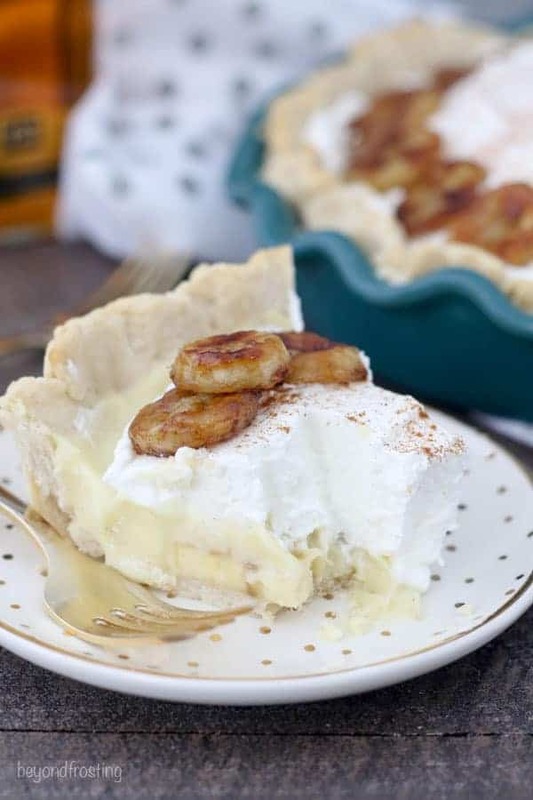 It’s your classic banana cream pie spiked with bourbon and topped with bruleed bananas. 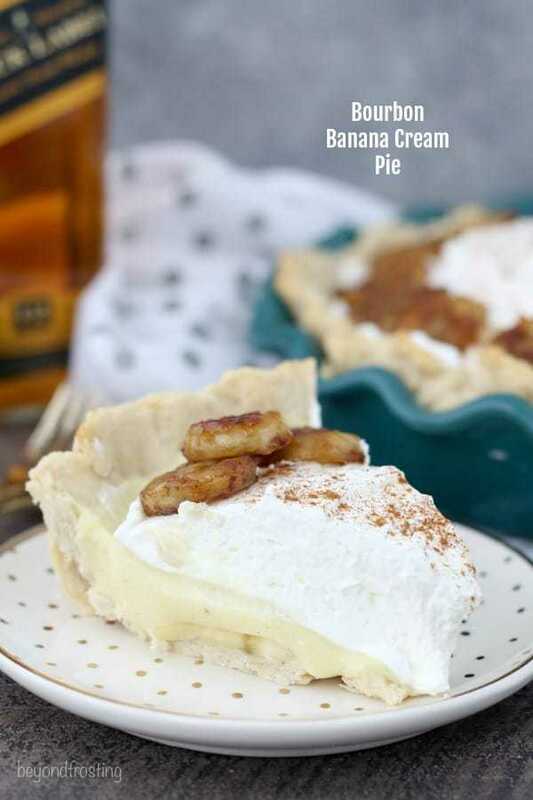 This pie has a traditional blind baked crust, with a bourbon vanilla cream filling, fresh bananas and homemade whipped cream. The vanilla pudding is my favorite part, it a little bit strong, but I really wanted that bourbon flavor to come through. The pudding is made with vanilla bean paste. It’s made on the stovetop with a combination of egg yolks, milk and sweetened condensed milk and the thickening agent is flour. 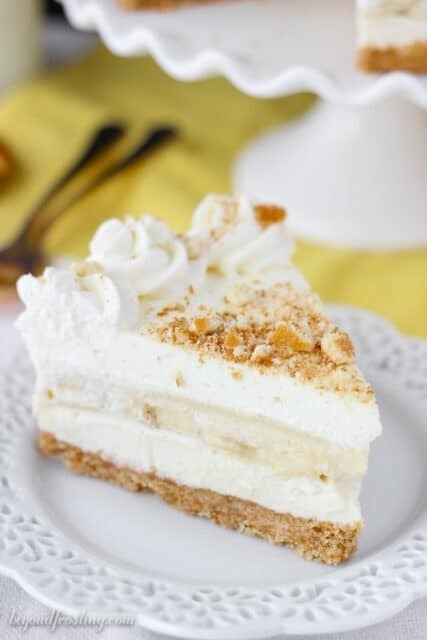 The recipe is similar to the one I used for my No-Bake Banana Pudding Cheesecake– one of my favorite recipes from my cookbook. Making homemade pudding is much easier than you think. I recommend getting all of the ingredients together before starting so your egg yolks are ready to go. I think sometime people get intimidated when they have to temper the yolks, which is done by adding the warm liquid to egg yolks and whisking it into the yolk. This slowly heats the yolk without actually cooking them. Then pour the tempered yolks back into the liquid mixture and whisk vigorously until it’s well incorporated. At this point the pudding will start to thicken quickly. Once it’s bubbling, you whisk in the bourbon and cook for an additional minute or two. The consistency may seem thin, but it will thicken as it cools. Ultimately, it’s more of a pudding consistency than a custard consistency. I then immediately cover the pudding with saran wrap (place it directly on the surface) which prevents the skin from forming on the top of the pudding. I prefer to let it cool before I refrigerate it. The crust for this pie is a traditional pie crust, which is blind baked in the oven. I don’t particularly have a favorite pie crust, but I rotate between a few of them depending on the day. I am definitely not the best pie crust maker and sometimes I get very frustrated. It shouldn’t be that hard! I could go on and on but I’ll spare you. Chop up some fresh bananas and then pour the cold pudding over top and finish it off with a heaping pie of whipped cream. Do you see that ratio of crust to filling to topping? Yeah, we’re good here. Now you don’t have to top this pie with caramelized bananas but I just thought it was a nice touch. For this, I just coated the bananas in brown sugar and then put them in a hot skillet. And each side cooks for 4-5 minutes until they are browned. These are very sticky though! If you have parchment paper to put these on, that is best so they won’t stick. 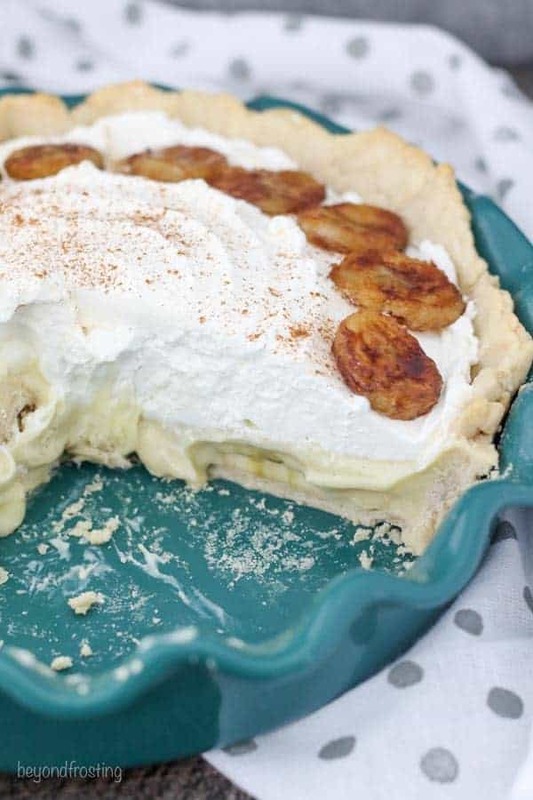 I could seriously eat this Bourbon Banana Cream Pie EVERY day and not be mad about it. Prepare your favorite pie crust and blind bake it. Cool completely. For the pudding: Measure out all of the ingredients for the pudding prior to starting. Place the egg yolks in a separate bowl and whisk lightly. In a medium-size saucepan, combine the milk & sweetened condensed milk. Heat over medium-low heat, whisking to combine. Add the granulated sugar, flour and vanilla bean paste. Whisk continually to dissolve the dry ingredients. Once the mixture is warm but not hot, pour about ¼ cup of the milk into the eggs and whisk vigorously. You will need to work quickly to prevent the eggs from becoming scrambled. Immediately pour the egg yolks back into the pan and whisk constantly until the pudding starts to thicken and lightly bubble. Remove the saucepan from the heat and add the bourbon. Cook for another 1-2 minutes, stirring occasionally. Remove the pudding from the heat and immediately strain the pudding through a fine sieve. Repeat one more time and pour the pudding into a medium-sized bowl. Immediately cover the top of the pudding with clear plastic wrap (directly on the surface of the pudding) and poke a few holes with a toothpick. Allow it to cool on the counter for at least 1 hour or until cooled to the touch. 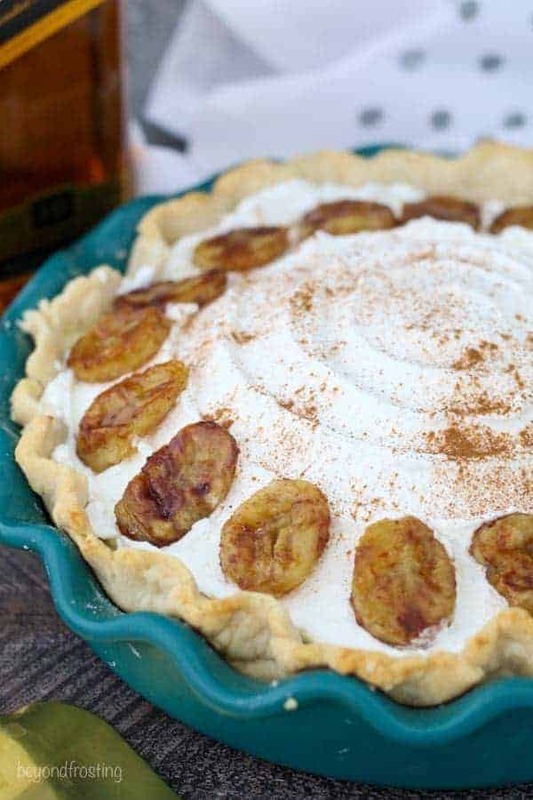 To assemble the pie: Slice the bananas and place in the bottom of the baked pie crust. Pour the cooled pudding over the bananas. Cover the top with clear plastic wrap and refrigerate for 3-4 hours until the pudding is set. For the topping: Chill a mixing bowl in the freezer for 10 minutes. Pour the heavy whipping cream into the chilled bowl. Use an electric mixer to beat the heavy cream on medium-high speed until the cream starts to thicken. For the caramelized bananas: Slice the bananas and roll in brown sugar. Coat a small saucepan with cooking spray and cook over medium-high heat. Cook the bananas on each side for 4-5 minutes until they turn golden brown. Cool on a plate and then place on top of the whipped cream. 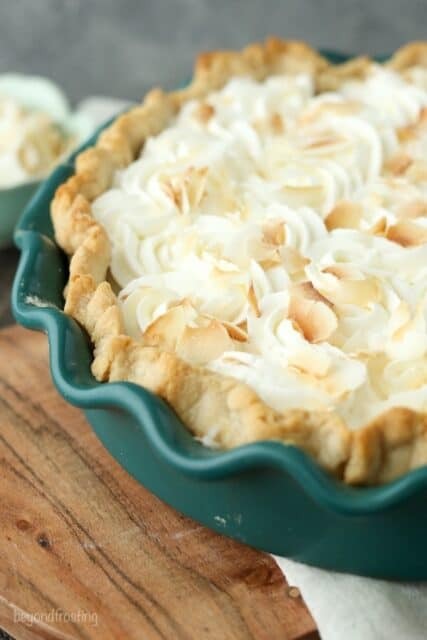 I am in love with this creamy recipe! The ingredients are my favorites!